A - B - Seymour: Countdown to Summer...with Good Behavior! I don't know how your kiddos are doing, but mine are definitely feeling the nearness of summer!! I honestly can't blame them though, because I am too! I am going to share my secret with you to encourage good behavior despite the end of the year craziness! It's my *STAR* activities and you can find them in my May Activity Pack and End of Year Countdown to Summer!! 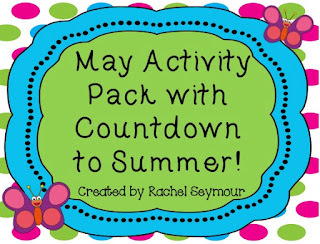 This pack includes a countdown to summer with fabulous, but cheap *star* activities. Your kiddos who are responsible and shine like stars during the day get to enjoy a fabulous star activity at the end of the day. Your kiddos who don't follow, or have a temporary memory loss and forget the rules don't get to participate. All day long you can walk by our room and hear me say, you better show me 'green' behavior or you won't get to do our star activity at the end of the day! It's also a great way to reward your kiddos who do try hard everyday to be responsible! Here are some pictures of my stars! They just hang up on a bulletin board. We started on day 22 this year. Sorry it's hard to see the top stars. The glare was terrible...as is my camera! Here's a close up of the stars we haven't turned over yet. I had leftover sidewalk chalk from last year so we went outside last week. It was such a hit that I picked up some more! You can click here to go to my TpT store and pick up these star activities. The best part is that it's on sale right now too! Teachers Pay Teachers is showing their appreciation for teachers this week by having a huge sale today and tomorrow! Just make sure you type in the code TAD13 when you check out to save up to 28% off!